Clementine apparel's original deep V-neck t-shirt is super-soft and instantly loved by all who wear it. 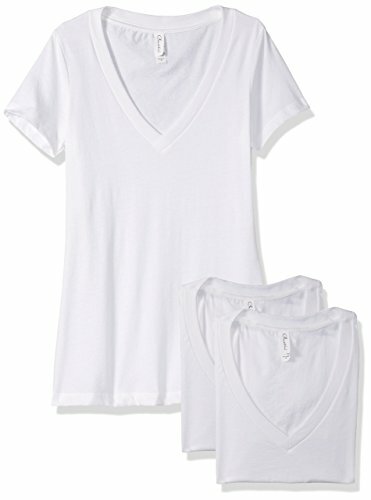 Quality make this V-neck an ideal choice for daily wear. Perfect for lounging, chilling, active or casual looks alike stretch ringspun jersey 60 percent combed ring-spun cotton/40 percent polyester lightweight jersey crisp yet casual look self-fabric binding fabric laundered for reduced shrinkage front cover-stitched 1x1 baby rib-knit set-in collar 32 singles for extreme softness comfortable fit slightly heathered machine wash cold. Do not bleach. Tumble dry low. EVERYDAY FASHION: These tees are great to wear as a fashion layering piece. Whether casual, basic, active or stylish, dress up down or in between; you can never go wrong with a solid white tees. EXTRAORDINARY TEE: Three pack of cotton blended short sleeve t shirt tops in various hues with deep v neckline for supreme comfort and style with a double-stitched sleeves and hem durability. Pre shrunk for a great fit. SIZE MATTERS: please note that this style runs slim so we highly recommend you order one size up or one size larger. For optimal sizing check size measurements.